Western Bottle News: Need a Cundurango? CUNDURANGO BITTERS EXTREMELY RARE FIND!! THIS UNUSUAL LIME SHADE OF GREEN IS IN FAIR CONDITION CONSIDERING PART OF THE TOP AND APPLIED LIP ARE MISSING. THERE IS AN APROX 1" LONG CRACK RIGHT ABOVE THE "C", SHOWN IN ONE OF THE TOP PHOTOS. THERE IS ALOT OF CRUDITY; BUBBLES THROUGHOUT. A COUPLE OF SCUFF MARKS ON SAME SHOULDER AS CRACK. THERE ARE NO OTHER CRACKS, CHIPS OR DINGS IN THIS BOTTLE. I HAVE BEEN TOLD THAT THE TOP IS VERY FIXABLE. SEAM ENDS AT TOP OF SHOULDERS, POLISHED PONTIL ON BOTTOM. BOTTLE STANDS 9 1/2" TALL. CUNDURANGO BITTERS WAS A PRODUCT OF THE GEORGE CHESLEY CO OF SAN FRANCISCO CA. 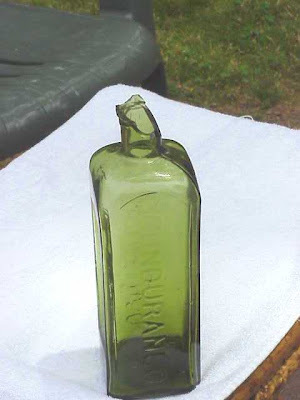 THE SAME BOTTLE CAN BE SEEN IN ITS' ENTIRETY , AT THE "AMERICAN BOTTLE AUCTIONS" WEB SITE UNDER CUNDURANGO BITTERS. OK, so I'm old and getting grumpier by the day. But, Fleabay, and the seemingly endless varieties of fluffy BS descriptions of some sellers, never cease to amaze me! In my book, this one comes mighty close to taking the cake! Let's see now; "IN FAIR CONDITION" - "PART OF THE TOP AND APPLIED LIP ARE MISSING" - " 1" LONG CRACK RIGHT ABOVE THE "C", A COUPLE OF SCUFF MARKS ON SAME SHOULDER AS CRACK - AND A POLISHED PONTIL ON BOTTOM" ? WHAT?!!! And all for a paltry opening bid of $500~. No wonder the listing seller has an 88% feedback rating. Excuse me while I stifle my gag reflex! What a terrific color example! The western version of the large variant Rosenbaums Bitters comes in this same color. Who is that clown? $500 opening bid is extremely greedy !! What's the problem? He does offer FREE SHIPPING to the sucker, er, I mean buyer. Hey! we all probably know this guy, he is from Sacto, according to his listing!! Did the maid knock a bottle off the Cunder shelf this time? ?